Although now out of stock at Ministry Grounds, I was pleased to get my hands on one of the last remaining bags of this particular coffee. Although I had sampled similar Cup of Excellence offerings at various brew bars around town, I had yet to roast my own CoE. In retrospect, though not a conscious decision, I suspect the slightly higher green price made me a little hesitant to throw it in my home roaster. Perhaps this suspicion was warranted, as it was not until the second roast batch a couple of weeks after the first did I feel I did the coffee justice. The evolution of my roasting to a lighter roast with more gentle heat increment seemed to better suit the flavour profile of this bean in the cup. Variations in roast batches aside, in the end things turned out pretty well – let’s see how it tasted. The harvest season at La Maravilla is from January to April. For quality control purposes they monitor traceability from handpicking right through until final delivery, and cup individual day lots. 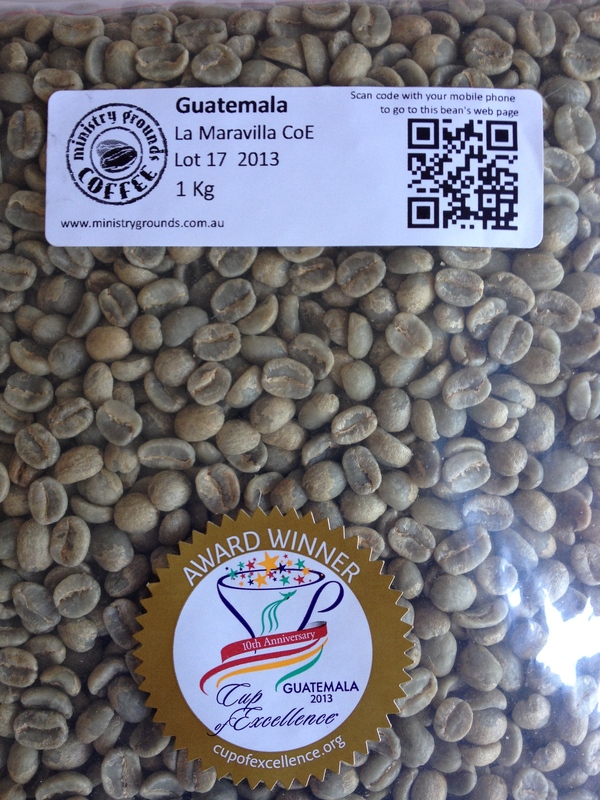 The coffee is processed by traditional wet mill and is sun-dried on patios,and then stored in a wood warehouse. Latte – When combined with milk, the resulting drink was a creamy, buttery, medium bodied, malt apple concoction. Probably not the most refined description, however those were the words jotted down in my Field Notes tasting record at the time. Overall, quite an enjoyable milk based drink first thing in the morning. Due to slight daily variations in my espresso based brewing, some days I end up with all of these flavours standing proudly – other days not so, and therefore was little hit and miss for me (my technique variation the culprit here I’m sure). V60 – Probably the pick of the bunch as far as the brew methods I experimented with. I note many recent What’s Brewing posts lack an espresso tasting component. As mentioned in another post which seems like an eternity ago, I consume these coffees as espresso somewhat less than I used to, preferring longer form brewing methods a little more these days. Back to the V60 and how this Guatemalan fares through the filter. There was something about this CoE that became apparent with repeated brews through the V60. To my fairly varied yet still amateur palate, the complexities of the flavour profile took a little while to become apparent to me. To explain a little, from the very first cup this was a very, very enjoyable coffee, however not the instantaneous – oh boy! moment that often occurs with great tasting brews. My initial thoughts were that I was missing something – and couldn’t quite describe to myself what I was really tasting. Until one day sitting drinking yet another cup, it was suddenly – there it is. A feature of my still developing coffee palate? Just a better day? A better roast? A better brew technique? I certainly have no idea which one is responsible – perhaps all of the above. Whatever the key factor was, it certainly had me thinking – I still have a lot to learn about this coffee roasting and brewing game. For some reason the subtleties suddenly became more obvious, with a bright citrus acidity, cherry and apple flavours combining to form almost a wine like flavour, with a hint of bergamot as the brew cooled. Similar flavours, though infinitely more refined than the dump and bash of the Aeropress (see below). The flavours just seemed to compliment each other much better, and although more subtle, with a little thought were probably more apparent all along than I had realised (characteristics of a Cup of Excellence perhaps, though more likely related to my position a very small way along a considerable learning curve). Aeropress – Given this is my mid-afternoon office brew, I prefer not to be fiddling about too much and prefer to get in and out of the communal kitchen as efficiently as possible. ^ As I am limited to the “always boiling” hot water urn rather than a kettle, the shot of chilled, filtered water cools the overall brew a little and avoids dumping boiling water directly onto the ground coffee. The result is a refreshing bright cup, with a hint of apple, along with a citrus orange acidity, and also seems a little herby. Somewhere in there was also a hint of cherry jam (hey! – that’s what my notes said). A bright clean finish made for a very enjoyable brew. Despite my initial roast batch not reaching the heights of the second go around with this coffee, as you may have gathered, this has perhaps been one of my favourite varieties so far. Its one thing to taste a coffee and note down a few flavours and tastes that show through, however entirely another to suddenly sense how they all fit together. Eloquent is not a word I would use in describing how well I have written about this particular coffee above, however have given it my best shot. In summary, let’s just say it was like one of those albums that upon first listen you think is OK, then by the fourth or fifth run though it becomes one of your all time favourites. Whilst there are many more varieties yet to sample, and this may not end up as one of my all time favourites, it is certainly up there in the mix. Great read, I am roasting through the Guatemala Rosma COE right now on my home roaster. The sweetness is bursting through finishing very clean. Happy roasting! That’s great! It has definitely been one of my favourites. Glad to hear yours is tasting well!